Join the OMAD Revolution! : Let's Talk! A lot of people's weight loss struggles are such that special guidance is needed to get them on the right path. This usually comes from a combination of both not having a clear direction in which to proceed and/or a serious medical condition or lifestyle obstacle. If this describes you, then maybe we should talk. Or maybe it doesn't describe you. Maybe you need guidance in working with a family member or close friend who is struggling. Either way, I'm here. Since successfully maintaining my weight, I have had well over three years' experience in sharing my journey and knowledge with others to help them tailor-make a plan, as they work toward rebuilding their health. The results: They have been fabulous! Unlike so many "nutrition consultants" and "health coaches" out there, I have actually gone on the pound-drop pilgrimage and returned "bearing gifts"! Yes, I have indeed lost the weight I claim to have lost, without resorting to lipo or lap band procedures, fads, or guru gimmicky of any kind. I am "the real deal" as my pictures and associates will attest to. I'm willing to work with you to get you the help you need. What are you waiting for? 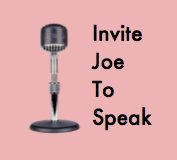 Just contact me via with "Consult with Joe" panel to your right.